This spring we joined an organic farm that provides fresh produce on a weekly basis. Every Wednesday, they set up in a park a couple blocks from our place. The weekly baskets are comprised of whatever was ready for harvest that week. For someone who doesn’t instinctually eat a lot of vegetables, it’s an easy way to force me to cook with them. And it forces me to be creative to use up the vegetables before the next week’s basket arrives. This week’s basket included a kohlrabi. It’s quite a freakish-looking vegetable in the cabbage family, but with nice juicy texture and earthy flavour. It’s freshness in a bowl. 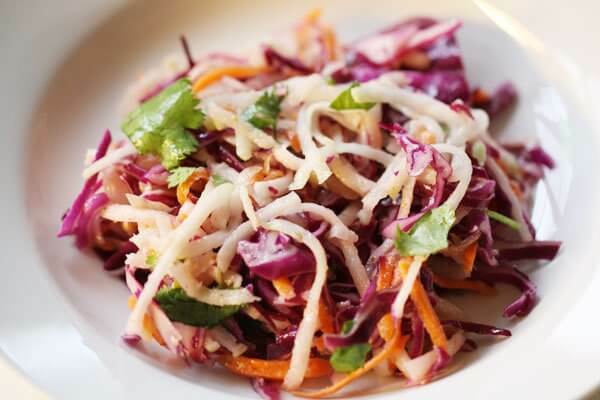 All the flavours blend together beautifully, creating a taste profile that’s quite unlike any coleslaw you’ve probably had. The perfect side dish for a warm summer day! Make it vegan. This recipe can be easily made vegan by substituting the honey for maple syrup, agave syrup or sugar.